(Yearling, 1960), pb., 154 pp. We have long enjoyed Peggy Parish’s Amelia Bedelia series, so we finally dipped into this book which is the first in the Liza, Bill, & Jed Mysteries. We loved this story! In fact, my 7 year old son (my youngest) had struggled to engage with our reading until this one. This story captivated him. Liza, Bill, and Jed are siblings who are spending the summer with their grandparents as they typically do. A favorite story that Grandpa tells the kids concerns a riddle with hidden treasures Grandpa’s grandfather left for his children years ago before he left for the Civil War. The first clue had been lost and for generations no one has been able to figure it out and find the treasure. 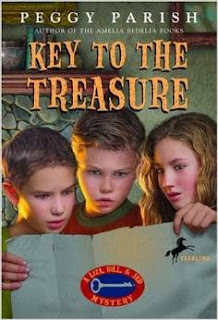 When the kids accidentally discover another clue they set off to find the generations-old treasure. Riddles, clues and treasure are just fun! The kids have to think, work and dig. Then the transgenerational aspect added another special element as this mystery is something the kids’ father, grandfather and great-grandfather had searched for. The strong family ties, respect and care portrayed in the story were encouraging. Furthermore, I liked the example of the kids playing outside, coming up with their own ideas, preparing to build a tree house on their own- just generally being creative and taking initiative. The book is simply written, positive and fun. We look forward to reading the second one. My Kids love the National Geographic almanacs and were excited to see this one. It is filled with nice color photos and information on nature, animals, history and culture. Tons of information is presented in bite size portions in an engaging manner. Of course, this is an entirely secular publications. A two-page spread covers the five main world religions with a brief description without advocating any one of them. Evolution is assumed in some key discussions. So, this is not an authoritative guide, but if you have discussed these issue with your children, then they can engage this and use it as a learning opportunity. Even with our fundamental disagreements we enjoy this for what it is- a fun tool to stimulate interest in a wide variety of areas with parental guidance.